Parcel #1: 84+- Acres. The Acreage is approximately 55+- Acres Tillable with the balance in Woodland and Pasture. 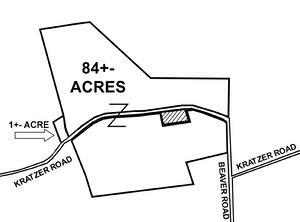 The Property has easy access with approximately 5000’ Frontage on Kratzer Road. Located on the Property is a 2 Story, 3 Bedroom Farm House. The Home has Large Eat-In Kitchen, Dining Room, & Living Room as well as a Lg Family Room with Fireplace. Also located on the Property is a Large Bank Barn, 2 Story Garage/Workshop, Small Chicken House, and Several Other Outbuildings to include a Quaint Summer Kitchen. Enjoy the views from the Open Front Porch. A Nice Country Get-away yet minutes from town. Parcel #2: 1+- Acre Wooded Lot located at the edge of the Farm. DIRECTIONS: From Selinsgrove take Route 522 South. Turn right onto Salem Road. Continue on Salem Road to Kratzer Road. Turn left onto Kratzer Road. Proceed to the auction on the left.